That's it! You'll get all the other Metawidget benefits (like layouts, Beans Binding, etc.) for free. 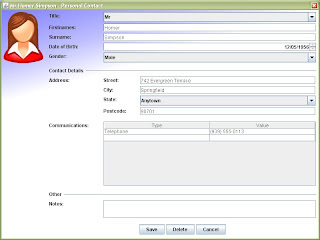 in the Address Book example Date is a nullable field. This causes errors if you click on anything other than Homer Simpson. Note that SwingX's JXDatePicker doesn't have this problem. I was trying to create my own SwingMetawidget class that would create JXDatePicker or JDateEditor components for java.util.Date. The build methods worked but when it came to binding the components the values from the JXDatePicker would not propagate to the bound variable. It might be because both JXDatePicker and JDateEditor do not have a getValue() / setValue() property but a getDate() / setDate(). I looked at creating a stub to resolve the binding but could not figure out how to do this. I also tried sub-classing these components and implementing the missing properties but somehow that also did not work. Is there something I can do to resolve this because JSpinner or JDateSpinner does not like null dates. Thanks for continuing to work with Metawidget. Funny, we had the exact same question on the forum a couple of days ago from someone else. I thought I would just comment here, if other people stumble on this post. I added the following to get JXDatePicker to work. If you find time to write a blog about your overall 'Metawidget and JXDatePicker' solution, I'd love to link to it from our Wiki.